Area bookstores have taken delivery of "California Indian Languages" by Humboldt State University Anthropology Professor Victor Golla. The milestone volume is the first encyclopedic reference book of all indigenous languages known to have existed in California before 1850. Published by UC Press and available at Eureka Books and Northtown Books, Arcata, Golla’s unprecedented survey spans aboriginal languages in California, southern Oregon, areas of Nevada and parts of Baja California. The omnibus work has drawn praise from fellow linguists and anthropologists alike. The book lays out in full detail the basic facts about every indigenous language of the California region, about 80 all told. Golla began work on the project in 2003, but the volume stems from a lifetime career in the study of indigenous languages in California and the Northwest. 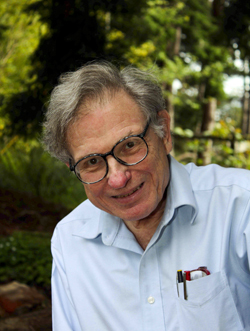 From the time of his graduate studies at Berkeley in the early 1960s, he has been a well-known figure in North American linguistics and anthropology. He served for more than two decades as the Executive Secretary of SSILA, the international professional society for American Indian linguistics. Golla’s compendium cites everything known about the languages of California as they have been recorded and transcribed by linguists and anthropologists since the 1880s. Also noted are the less systematic, but still valuable materials collected by earlier explorers and missionaries, beginning with Cabrillo in the 1540s. Special sections are devoted to extensive field collections developed by C. Hart Merriam and J. P. Harrington during the first half of the 20th century.